A light giving body; something the inspires awe and creativity; glow, shine, sculpt, construct; a beacon, a guide, a place to gather around. Riverside Arts Center heads into the darkening days of November with LUMINARY; a celebration of light. The space will be filled with shining work that glows, flashes, blinks and moves. 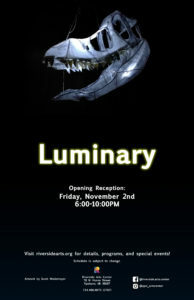 Do not miss LUMINARY showing at Riverside Arts Center through the month of November.